Remove jewelry and clothing from the treatment area and inspect the skin. Cover any open areas with gauze or an appropriate dressing. Place the patient in a comfortable position, with the affected limb elevated. 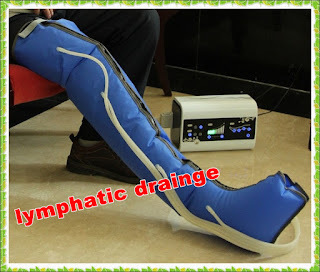 Limb elevation reduces both the pain and the edema cause by venous insufficiency, if applied soon after the development of these symptoms, because elevation allows gravity to accelerate the flow of blood in the veins towards the heart. Measure and record the limb circumference at a number of places with reference to bony landmarks. Place stocking or stockinet over the areas to be treated and smooth out all the wrinkles, apply the sleeve from the compression unit, and attach the hose from the compression pump to the sleeve. Remeasure and record limb volume in the same manner as step 4 to compare. Apply a compression garment or bandage to maintain the reduction in edema between treatments. Pressure should be atleast 20 mmhg below diastolic blood pressure.